Some of William Floyd’s amazingly talented student artists (l-r) Jessica Munoz-Quintanilla, Emily Barros, Fine Arts chairperson Theresa Bianco, Lorraine Wimpelberg and Stephanie Shanley. 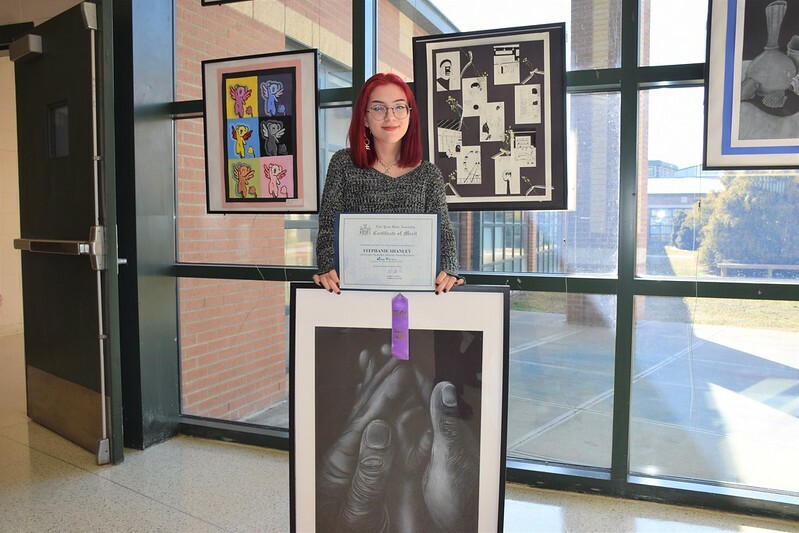 William Floyd High School student-artists were recently honored at the “All County & Scholarship Art Show” sponsored by the Suffolk County Art Leaders Association (SCALA) in partnership with the Babylon Citizens Council on the Arts (BACCA). The event, held at Babylon Town Hall, featured talented student artists from across Long Island with William Floyd High School students taking home several top honors. Senior Stephanie Shanley earned an All-County honorable mention for her charcoal drawing titled, “Only Small for a Short Time.” This monochromatic piece shows a large hand delicately cradling a small child’s hand. “Her sensitivity to this relationship is evident in her technique as she lightly shadows and shades the hands together,” noted Mrs. Bianco. Please scroll through the album below to see the photos of the students with their work!